It was ten minutes over 1 pm when the massive rocket AKA Delta IV Heavy launched from the West Coast of United States of America. 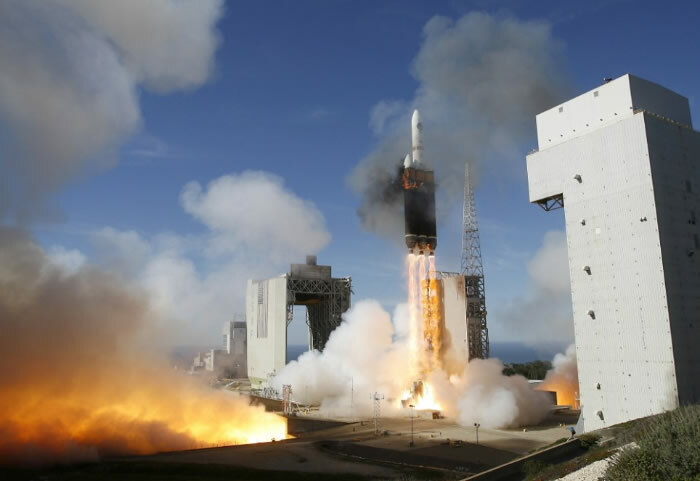 The 72m-high Delta IV Heavy was carrying classified satellite and a national security payload for the National Reconnaissance Office (NRO). Just 100 million USD were spent upgrading the SLC-6 launch pad. With 72 meters height, the equivalent to 23 floors, the rocket was built by United Launch Alliance. The company is a mix of Lockheed Martin Corp. and Boeing Co. This was the fith rocket airborne since its initial flight in 2004. Austronautix, the Astronautic Encyclopedia, stated that the development cost was of 500.000 million USD and the Launch Price was of 254.000 million USD in 2004. News Time reported that United Technologies Corp., parent of Sikorsky Aircraft Corp., which employs about 7,000 people at its helicopter plant in Stratford, lost 36 cents to close at $79.55, despite reporting that three Pratt & Whitney Rocketdyne RS-68 booster engines and one upper-stage RL10B-2 engine lifted a United Launch Alliance Delta IV Heavy rocket into space at Vandenberg Air Force Base. It carried a U.S. government satellite. Col. Richard Boltz. said to LompocRecord, �This will be the largest rocket ever launched from Vandenberg, but not the most powerful,� Boltz said, adding that it can carry a payload about the size of the Greyhound bus. Lompoc Record also reported on the key business for Vangenberg�s Rockets. The National Reconnaissance Office will be a key customer for Vandenberg�s rockets in 2011.